This MacGregor 26 Sailboat sports a dodger and bimini top that were custom designed, fabricated, and installed. Any boater who has spent much time on open water in rough chop or rain knows that cockpit dodgers are important — not just for comfort, but to protect the helmsman and give him forward visibility that he otherwise wouldn't have. Dodgers also protect the open companionway from incoming waves or rain, and permit the companionway to be left open during rain showers while at anchor or dock. The traditional dodger design has withstood the test of time. 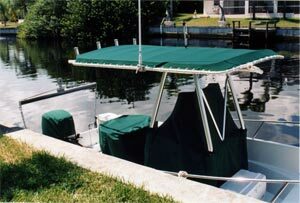 A two-bowed frame attaches to the boat and supports a one-piece canvas cover with isinglass inserts. The disadvantage to this design is that these dodgers typically fold forward out of the way when not being used, which puts wrinkles, and often scratches, in the isinglass, soon rendering it useless for visibility. A newer dodger style, known as the California dodger, uses a similar two-piece frame, but has roll-up front windows and removable side panels. This type of dodger can be left in place when not in use, and the canvas and isinglass can be easily deployed when needed. When not in use, the front isinglass windows are removed, rolled carefully, and stowed away, which helps to keep the isinglass in good condition and helps it last longer. Dodgers can be custom fabricated to attach to an existing bimini top, or made with a detachable awning that zips in place place between the dodger and bimini. 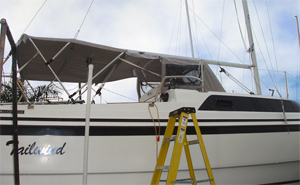 The detachable awning can be removed while the bimini and dodger are left in place, or both the dodger and bimini can be stowed. Dodgers can also be fabricated as part of a complete cockpit enclosure, such that the dodger and the rest of the enclosure can be deployed or removed separately, as needed. Dodgers are often fabricated with a variety of convenient features, such as side pockets for charts, sunscreen, or binoculars, chafing guards and corner reinforcements to help the canvas last longer, and overhead or side grab rails in convenient locations. The best dodgers will be custom designed to blend in with your boat and to maintain the aerodynamics of the boat as much as possible. An aerodynamic dodger reduces windage, avoids interfering with the boat's speed, saves on fuel consumption, and is generally structurally stronger, as well. Dodgers can be purchased ready-made for many popular boat makes and models, but custom dodgers are often needed. The advantage of having a dodger custom-made for your boat is that you can have the dodger made specifically for your own preferences. How high do you want the front of the dodger? Do you want the outer side wall of the dodger to run inside or outside your jam cleats? Do you want certain panels to be removable separately? How much isinglass do you want on the front and sides for visibility, versus how much canvas for protection from the sun? How far forward of the companionway do you want the front of the dodger to be located? Your custom dodger fabricator will be able to advise you of any potential problems to consider in your desired design, and will be willing to work with you to make sure you get the best dodger for your boat.